I’m also fully aware that these sentences are probably too brief to be a complete picture of the complexity of teacher practice. There are entire books on giving good feedback and understanding formative assessment. I do not view this list as a simple check-list but rather as a starting place for teachers and teacher-educators to ask questions about effective teaching practice. I’m sharing this graphic with a Creative Commons Attribution, Non-commercial, Share-alike license. You can make a copy to modify it here if you like, provided you make any changes from the original obvious, and provide appropriate attribution. Also, here is a PDF version. What else would you include? What do you disagree with? Do you have any clarifying questions about what I mean by anything on this list? Could you build a nuclear power plant given the right reward? Lots in common here. I like that your list is more straightforward. My name is Robin Hinson and I am in a class called EDM 310 at the University of South Alabama. I was assigned to comment on your blog this week. As a future teacher, this list of 20 things every teacher should do, will really come in handy for me. I think it is important, like you said, to not simply use this as a checklist, but to keep all of these points into consideration when starting my teaching career. My favorite point is “Learn something new every day.” I absolutely agree that as teachers we are also learning all the time and that is how we grow as educators. I will hope to keep all of these 20 things in mind when starting my journey as a teacher. I really enjoyed reading your thoughts on your blog, I look forward to seeing more of your posts in the future that I can also learn from. Thank you for commenting on my post. I checked out your blog. Great work. Keep at it. If you look at my oldest posts you can see how much I have learned through this process. My name is Courtney Hall and I have chosen your blog this week to comment on for my EDM 310 class at the University of South Alabama. I chose this post to comment on because I think these 20 things every teacher should to do to be very important to keep in mind. I hope to become a first grade teacher, and helpful tips like these can always be useful! Thank you for sharing this post with us! How do you see implementing these when teaching first grade? What would it look like? My name is Marie and I am a student at the University of South Alabama and in the class EDM310. I have been assigned to comment on your blog this week. 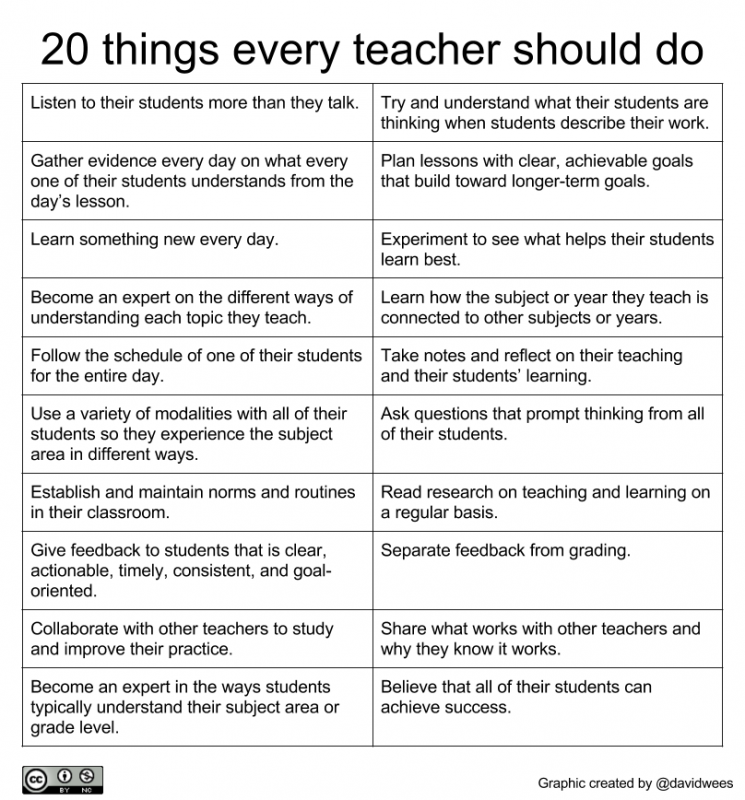 I love your “20 things every teacher should do”. I will keep them in mind for when I become a teacher. My favorite is the “learn something new everyday”. From day one Dr. Strange has told us how important it is to always continue to learn. I couldn’t agree more!